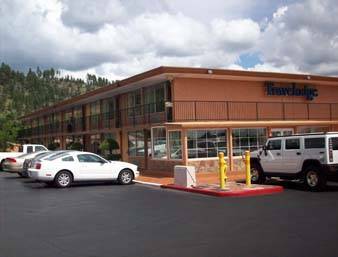 The Travelodge Flagstaff - NAU Conference Center located in Flagstaff, AZ is a nostalgic Route 66 hotel near downtown Flagstaff, Arizona. Convenient to shopping, dining, hiking, and many other outdoor activities, the Travelodge Route 66 is a splendid hub for visiting the Grand Canyon, Sedona, the Navajo and Hopi Reservations, Page and Lake Powell, the Painted Desert, the Petrified Forest, and Meteor Crater. Other Attractions include Lowell Observatory, Riordan Mansion and historic downtown Flagstaff. There is easy access to all major highways including I-17. I-40, Hwy 180 and Hwy 89 that will take you to all the natural and historic treasures of Northern Arizona. Be sure to travel Route 66 and enjoy a trip to the past in the restored towns along the way such as Ash Fork, Seligman, Winslow and of course Flagstaff itself. Pets allowed in designated rooms with fee of 10. 00. If you are looking for something different, this is the place! Located on a quiet hilltop near NAU and the Conference Center, and Downtown. Credit card required for reservations, cancelations must occur 24 hours prior to 4pm day of arrival.